This is the extraordinary story of the foundation of what would become the major threat to the West during the Cold War – built by the Bolsheviks from nothing. There are more than 200 photographs, most previously unpublished. It includes all classes of battleships, cruisers, destroyers, submarines, and other surface vessels, with full specifications including builders, tonnage, speed, and armament. There is no other book available for the naval enthusiast on this subject, because the information was buried—despite the fact that, for example, the Soviet Union had more submarines than the Germans and the Americans put together at the start of World War II. This is a truly unique volume on a neglected area of military history. At the revolution, the Tsar's navy, such as it was, was obsolete and scattered, much of it never to return home. From a standing start a huge fleet was built by the Bolsheviks, who were obliged to deal with the West: engines from Italy, warship plans and gun turrets from Germany (in exchange for 3.5 million tons of food and material as late as February 1940). 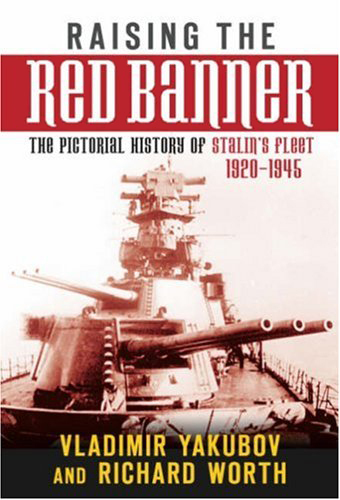 The pictorial content alone of Raising the Red Banner is of immense interest to naval enthusiasts and students of WWII.